Two things can predispose us in this band’s favour before even hearing their music: they have the best band name, Bart, and the best album name, Holomew. In this way, they edge out the previous undisputed champions—themselves with 2014’s Bart (EP) by Bart. Bart by Bart came out swinging in a barrage of fragmented and skittish guitar figures, anchored by a supremely funky rhythm section. While the pleasures of Holomew are subtler, they are no less deep. To me, it is (though still very rockin’) a contemplative album. Holomew begins with the words “Who’s coming along with me?”, and with that, we are invited into Bart’s world of harmonized falsetto vocals and arpeggiated guitar polyphony. A “maximal, musical experience”, as the press release describes it. 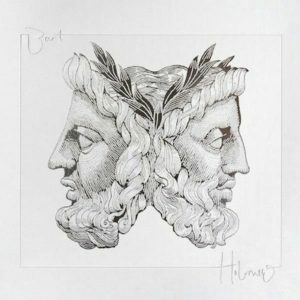 The album cover depicts the two-faced Roman god Janus, and this seems especially fitting for Holomew’s flavour. Twinned voice and guitar melody lines form the backbone of Bart’s lovely music. Apart from this more superficial comparison, it’s also neat to note that Janus is a god of transitions, looking both to the past and the future. Bart’s songs shift swiftly from one theme to the next, executing progressive rock that, mercifully, does not feel like a winking homage. Bart’s music, though not at all self-serious, sounds lived-in and genuine. In my view, Holomew is a very timely album. In a time when every philosopher with a cool synth patch or two can be hailed as a genius, Bart’s thoughtful and highly technical prog rock is a refreshing voice in the wider musical conversation.